Performance Time: Approximately 30 mins, 28 pgs. CLASSIC. Adapted from The Jungle Book’s “Her Majesty’s Servants” by Rudyard Kipling. At a crowded military camp in northern India, a fearful baggage camel runs through the camp at night, knocking over soldiers’ tents and waking everyone up...men and beasts alike! 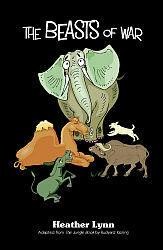 During the stampede, the baggage camel runs into two mules, a troop horse, two oxen, and Two Tails the elephant. These beasts of war describe their jobs with pride: Camels carry baggage, elephants and oxen drag canons, mules transport heavy guns, and cavalry horses carry their masters into battle. When the young mule asks, “Why do we have to fight at all?” the troop horse replies, “All you have to do is obey the man at your head and ask no questions.” “But who gives the men orders?” the mule wonders. In this humorous, witty Kipling classic, these war animals come to realize that though they may be beasts of burden, their biggest burden is war itself. 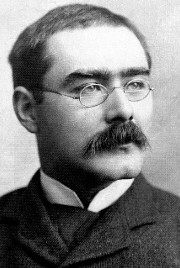 British author and journalist Rudyard Kipling (1865-1936) was born in India and lived there for several years. The Jungle Book was published in 1894 and remains one of Kipling’s most famous works. Kipling won the nobel prize for literature in 1907.